Ayutthaya, the ancient capital of Siam, is 80km north of Thailand’s present-day capital city and makes for an excellent day trip from Bangkok. Better still if you have the time, spend a night or two here before heading further north to Sukhothai or Chiang Mai. Steeped in history, Ayutthaya was ravaged by the Burmese in 1767 and the city was abandoned. The impressive remains of the historic temples form a dramatic backdrop to this pleasant riverside city. Many tourists visit Ayutthaya on a day trip from Bangkok and there isn’t the same wide choice of hotels you find at other popular tourist destinations in Thailand. Much of the accommodation nearest to Ayutthaya Historical Park is of the cheap and cheerful type with anything grander tending to be slightly further away. 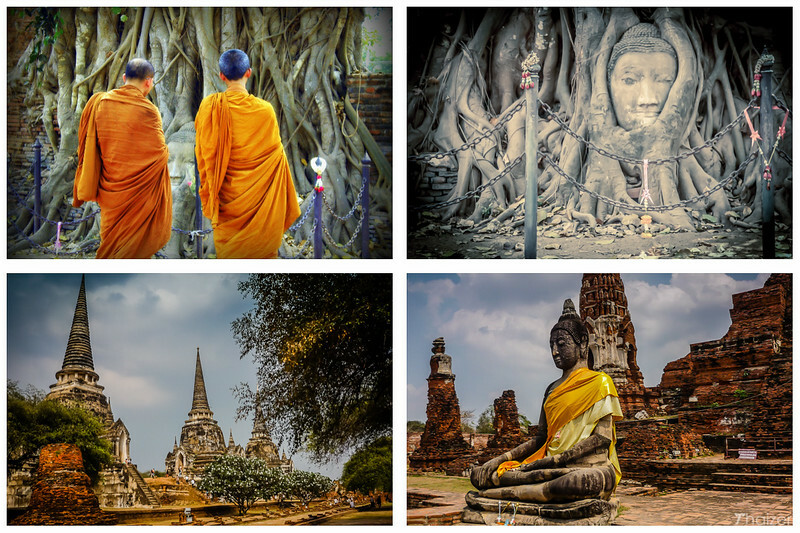 There are numerous sights and ancient temples scattered around Ayutthaya. These can be visited as part of an organised tour or alternatively it’s easy enough to hire a bicycle for independent exploring. Tuk-tuks can also be hired to take you to the main sites in and around the the main Ayutthaya Historical Park. Three rivers (the Prasak, Chao Phraya and Lopburi) actually encircle the old temples and it’s possible to take a boat trip once you are in Ayutthaya that takes in some of the main sights. Ayutthaya is recognised as a UNESCO World Heritage Site and to celebrate this, an annual fair is held at the Ayutthaya Historical Park. A light and sound show uses Wat Mahathat as the backdrop and the week-long festival features cultural performances, merit-making events, beauty pageants, street stalls, music, and a sanuk atmosphere. As the spiritual home of Muay Thai (Thai boxing), Ayutthaya hosts the Martial Arts Festival and Wai Khru Ceremony. The event also pays homage to a Muay Thai hero who came from Ayutthaya, Nai Khanom Tom. Displays of Thai boxing and martial arts attract participants from around the world and the week-long festival culminates on March 17 which is National Muay Thai Day in Thailand. From Hualamphong train station in Bangkok it is approximately a 90 minute train journey to Ayutthaya. A one-way ticket ranges from 15 Baht to 66 Baht depending on how much comfort you require (the cheapest seats in 3rd class are hard wooden ones). On arrival at Ayutthaya train station, head out of the main entrance and make the short trip by foot to the pier where a ferry takes passengers across the Pasak River. Most of the main sights and accommodation are located on the other side of the Pasak River. Buses and mini-vans for Ayutthaya depart at regular intervals throughout the day from Bangkok’s Northern Bus Terminal at Mo Chit. Depending on traffic and number of stops, journey time can range from 1.5-2 hours with a fare of between 35-60 Baht. In the absence of a public passenger boat service to Ayutthaya, a number of private companies fill the void by operating tours. A typical day tour from Bangkok involves a cruise to Ayutthaya, lunch, a tour of the main temples and a return trip by road.